When I visit a blog (and of course I'm not talking about yours) and see some button or phrase encouraging (begging) people to [please!] leave comments, I roll my eyes. If you're begging for the comments to see just how many people's lives your blog is touching, I say: Install a stat counter. If you're wanting the comments to tell you how yummy! your Apple Dump Cake looks, I say: If you're not already confident in its exquisite presentation and tastiness, you oughta toss that recipe and shouldn't have posted it in the first place. If you're wanting comments to assure you that you're an interesting person and that No, your life's not been reduced to diapers and Grey's Anatomy on DVD, I say: Go kiss your husband/boyfriend/baby/whatever and find assurance of your intrigue in human contact and conversation. If you're wanting comments to tell you how beautiful your baby is, I say: Get counseling. If you aren't already convinced of your child's superior beauty (for it's inconceivable that a parent wouldn't be 300% googly over their squishy baby no matter how unattractive it is to everyone else), there's something wrong with you. If you're wanting comments as an element of some blog popularity contest, I say: Give it a rest, and know that someone will always receive more comments than you do and that Pioneer Woman will always have them beat on giveaway days. Why sure, I like comments on Remarks from Sparks. I like 'em a lot. They cause the little whistle sound on my phone telling me I have new mail! They often make me laugh. They help other people connect. They help readers experience catharsis for being able to tell someone (me) just what they think of them. They have returned me to old friends and brought me new ones. They have linked me to new blogs. And they entertain my husband. But the comments aren't why I blog. I'm too selfish for that. I blog for me. And for the Bird. And Rabid. And Morgan. And people like 'em that get a kick out of the twaddle I deposit here. I blog because I have things to say and sometimes need a place to scream 'em. I blog because there are days I am feeling punchy and want to get a rise out of people without face-to-face interaction (or rather, I blog 'cause I'm a confrontational wuss and pretend to wield power here). So in honor of comments and to lampoon everyone's groveling for them, I've made a gift. An image. For your sidebar. Take it if you want it. But more than that, if you have the guts for it. Tongue-in-cheek (never tongue-in-check) is how we like it 'round here. If you can't stand the heat . . . well you know what's not for you. I was so excited for this post. i just asked for comments. :D want to know why? because I am a college student, single, and find other people stories so interesting. So when they comment, I can then, in turn, follow them and learn about other peoples lives. I asked people to follow me... because well, I am curious. and NEEDY. It's true.. Im a comment whore. "Comment Whore". Brilliant Shelby Lou. Maybe I will go comment on your blog right now to help you feel validated. You've earned it. Everyone, start using "Comment Whore". LOL! Meg, I am so glad to see the virus that you contracted did not take any part of your wit and humor! You got a virus? Did it wipe out your hard drive? Did it send phishing e-mails to everyone in your address book? Viruses are bad. I'll bet viruses are created by poor schmucks who don't have anyone commenting on their blogs. I like it when comments turn into a blog post all on their own. The comment-tator will feel taken because they've created something awesome in the comment section of one of my posts and will subsequently post a link to MY blog on their blog. Utlimately, this ends up with more hits on my blog and I feel validated and important. And whorish. On another totally unreletated note (well it might be releated 'cause it has to do with comments). I should comment about my annoying family on your blog. That way I can "get it out there" without stirring it up too much. Thanks for the image by the way. It's up and running. Aaaaamen! ...but sometimes its nice to validated. but i think i'll pass (on the button)...your so considerate! :0) Glad to see your posts pop up again on my dashboard! Yay yah! laughed pretty hard as i read. laughed so hard at the "button" that diet coke came out of my nose. oh and, will do whitney. will do. 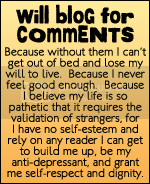 The rolling of the eyes is my instant reaction when reading a blog with a permanent sidebar plea for comments. There have been a few blogs I just can't read anymore because they have written not one but several posts crying, begging, and in the end getting angry over no comments. I'll comment when I have something to say. The end. p.s. love the button but I'm thinking some people won't get it and then I might appear to be one of "them".